Happy New Year and welcome to the 2019 VPN in China blog page. This is the page where you can find real VPN speed test results and performance testing using top recommended VPNs for China and tips for getting the best performance when using a VPN in China. I have been testing VPNs in China extensively since 2016. This is the fourth annual VPN in China blog page. Unless stated otherwise, all tests are done from my Guangdong China Telecom 100/20M residential internet connection. I have some great news for ExpressVPN users to start off the new year. Hong Kong 3 is back. If you have been following the previous year's VPN in China blog pages, then you will know that ExpressVPN Hong Kong 3 is the best VPN server available anywhere. Hosted on Rackspace Hong Kong special China Telecom CN2 lines, this server is fast as lightning 24 hours a day. Even during the peak bandwidth congestion at 11pm. Not only does this server have CN2 routing for China Telecom, it is also directly connected to China Unicom and China Mobile. Although ExpressVPN did a great job keeping their VPN service working in China during the great VPN crackdown of 2017, Hong Kong 3 was not one of the servers that was kept online during this time. It feels good to finally feel the speed of Hong Kong 3 again. Here are a few more of my top recommended ExpressVPN servers for China. Hong Kong 1 has stealth CN2 routing, but the speed is limited to 10Mbps. It's a good alternative if Hong Kong 3 is not working. You still get the same low latency and low packet loss, but with a slightly slower download speed. All of the ExpressVPN links from Tips for China come with a special offer of 3 months free when you buy a new 12 month subscription. You still get the famous 30 day no hassle money back guarantee with this offer, so you can try it risk-free and get 3 months free. On to my second favorite VPN to use in China, VPN.ac. Hong Kong Kowloon is my favorite VPN server to use in China for VPN.ac. Although it lacks the China Telecom CN2 routing like ExpressVPN Hong Kong 3 and Hong Kong 1, it still performs very well most of the time. However, it will slow down sometimes especially during peak night time hours. Finally, here is a test from NordVPN using the third party open-source OpenVPN GUI app. I prefer to use the manual OpenVPN configurations with NordVPN because the Windows app does not work good on my computer (possible conflict with other VPN apps). 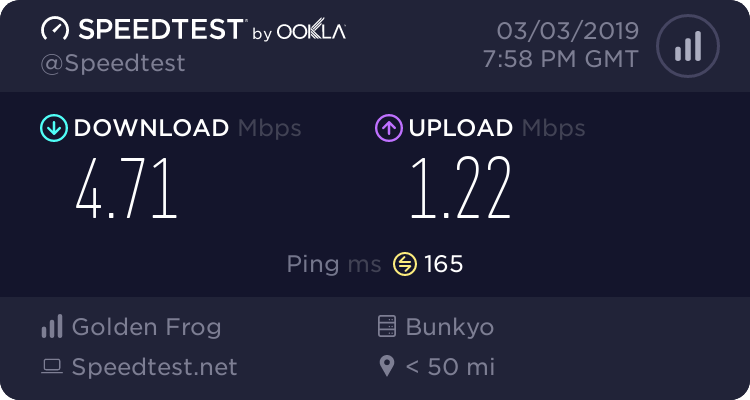 I couldn't find any NordVPN Asian servers that would connect for me today, so I tested a US server. NordVPN doesn't come close to matching the performance of my top 2 recommended VPNs, but it does have a very big advantage. NordVPN is always running some kind of promotion. Currently, you can get 3 years for only $107.55 (works out to $2.99 per month). I'm currently travelling outside of China, but I left a computer running at home, which I can access remotely. These tests were done from my China Telecom 100/20M Fibre home internet connection on an old Windows 7 computer. Someone told me that ExpressVPN Hong Kong 3 is no longer working in China. That appears to be the case, as I was unable to make a connection to Hong Kong 3. This is unfortunate, but not too surprising. China is really cracking down hard on VPNs these days. Here are the best working ExpressVPN servers to use in China right now. Although Hong Kong 1 is limited to 10Mbps download speed, the stealth-CN2 China routing will always give you ultra low latency and packet loss (even during peak bandwidth hours at night). Use this server if you need reliable connection for gaming, web browsing, or video streaming (up to 1080p). If you're torrenting or downloading large files, you might need something with higher download speed. Normally I would test VPN.ac now, but my subscription just expired. I'm going to wait until I get back to China in a few weeks before I renew it, so check back soon for some VPN.ac speed test results. VyprVPN has been having major issues in China lately, but someone told me that it was working again. It certainly is not working for me. I downloaded the latest app for Windows, and tried several server locations and protocols (including Chameleon). But I was unable to get a single successful connection. If anyone is able to get a successful connection with VyprVPN in China right now, please leave a comment below and tell me how you did it! If you want to try for yourself, you can always get a free 3 day trial. However, you will need to sign up for it using another VPN if you are in China. All of their domains (including the ones normally accessible form China) seem to be blocked. The last time I tested NordVPN, I wasn't able to connect using the standard OpenVPN config files (which is my preferred way to connect to NordVPN). Today I had to install the latest NordVPN app for Windows to test the "obfuscated" servers. NordVPN seems to be working relatively well with the obfuscated servers. 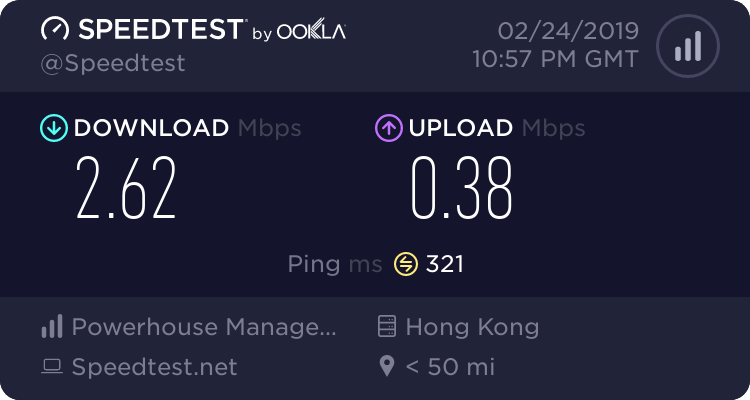 The NordVPN Hong Kong obfuscated servers are hosted on Leaseweb, which does not have direct peering with China Telecom, hence the very high latency. However, it does have direct peering with China Unicom if I recall correctly. I will be sure to test this one again using my China Unicom data connection when I get back to China. For now, I can only test China Telecom. The Japan #135 server seems to be the best NordVPN to use with China Telecom right now. 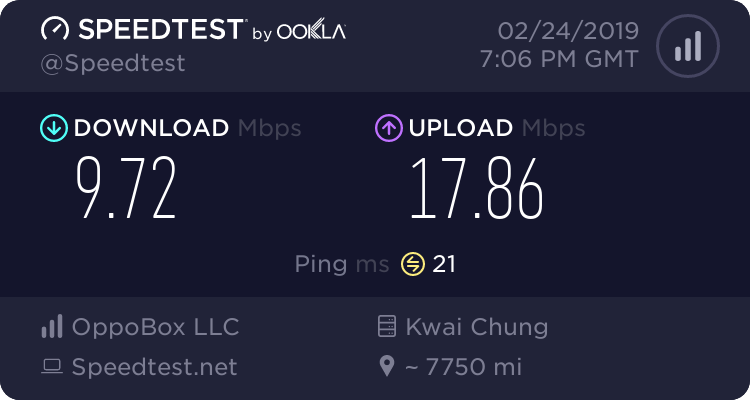 Of course, none of the NordVPN servers have good latency to China Telecom like the ExpressVPN Hong Kong servers, but the performance is pretty good for the price. NordVPN is still offering the 3 year special for $107.55, that works out to only $2.99/month. It's hard to beat that price for any VPN, never mind one that works in China. Unfortunately, NordVPN has recently stopped accepting PayPal payments for VPN subscriptions. This will make things more difficult for foreigners in China. Alipay and WeChat require a Chinese ID card to make payments to overseas merchants, so that only leaves UnionPay (Chinese bank card) and credit cards as payment options. Check back soon for more VPN testing from China. After talking with VyprVPN support, they suggested setting the Chameleon port setting from Automatic to manual port 15001. So I did that, as shown below. After setting the port to 15001, I can connect! 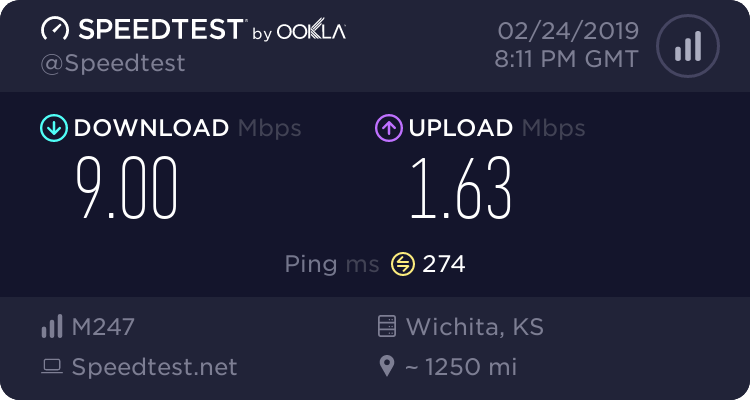 These speeds are nothing to get excited about, but at least it works. It appears that ExpressVPN is currently having connectivity issues for users in China. This is likely caused by another government meeting going on in China. I can only test using China Telecom on Windows (via remote access) because I'm not in China right now. Some servers might be working with different combinations of ISPs and operating systems. For example, my friend told me that Los Angeles 2 is working on his iPhone. This is the second time ever since 2016 that I have not been able to get a single working connection using ExpressVPN in China (see update below). The last time was on June 25, 2018. You can read the details on the 2018 blog page. ExpressVPN restored connectivity in China within 24 hours, so I don't expect we will be waiting too long this time either. This is one of the main advantages of ExpressVPN. Any VPN service can get blocked, but only a really good one will get back online quickly. For example, VyprVPN was completely blocked recently and it was dead for almost a month! Update - I spoke too soon. There is 1 server that is working. Thanks to Twitter user @Dillon_lu for recommending Taiwan via HK 2. Those of you who followed my advice and got a backup VPN in addition to ExpressVPN will be glad that you did so. For those who don't have a backup yet and can't wait to get back online, here are some options to consider. The NordVPN obfuscated Japan #135 server seems to be the best option right now. I played a few YouTube videos to check the stability and so far so good. No problem streaming 1080p resolution, getting around 19 Mbps. VyprVPN seems to still be working with the Chameleon port manually set to 15001, although the speed is extremely slow. If you are in China and want to try VyprVPN, it will be tricky because there is no China accessible site available right now. So you will need to use another working VPN in order to sign up for the free trial. Although a proxy lacks the security and full compatibility of a VPN, ShadowsocksR is a very good protocol for China. Although you can rent a VPS and make your own ShadowsocksR server on a VPS, subscribing to WannaFlix is a much better option. I will be travelling over the next few days and won't have time to do many tests. Please help me keep this page up to date by leaving your comments below! Although the Taiwan via Hong Kong 2 server is no longer working, I found 3 other ExpressVPN servers that are working today. All of these servers took a very long time to connect (1 to 2 minutes). So don't cancel the connection attempt, just keep waiting. All 3 servers are giving very good download speeds, but Tokyo 2 and Sydney 2 have a high ping. The Hollywood server has the best performance. Low ping (for USA) and good download speed too. Let's see how the NordVPN obfuscated servers are working today. And finally VyprVPN, using Chameleon with port 15001. All of the speeds are quite fast today (except VyprVPN) because it's 4:00am (Mar 4) in China right now. I will try to do some more tests during normal China hours in the next few days. Just a quick note that NordVPN has introduced a new special for China users. The offer is 3 months for the price of 2 months. To take advantage of this offer, you need to go to NordVPN with your VPN or proxy turned OFF. The offer is only available if you are accessing the NordVPN website with a Chinese IP address. Unfortunately, the landing page is only in Chinese so I will provide a brief translation here. Once you choose one of the 2 offers, you can then change the language to English on the order page (at the bottom right of the page). Today is the first day of the "big meetings" in Beijing. The Great Firewall has really tightened up. Right now I can't get any working connection on ExpressVPN. I connected successfully to NordVPN, but it seems to be a bad connection because it disconnected my remote connection to my computer in China. So now I'm locked out of my computer and need to wait until someone can go into my apartment and disconnect the NordVPN connection. Once I get back on my China computer, I will test WannaFlix first because there is no risk of getting locked out when using a proxy instead of a VPN. I managed to get back on my computer and disconnect NordVPN. I think ShadowsocksR might be a better option to use right now. The speed is even faster than testing to a China server without any VPN/proxy! The Hong Kong server is definitely the best server of WannaFlix. But here are a few more tests. 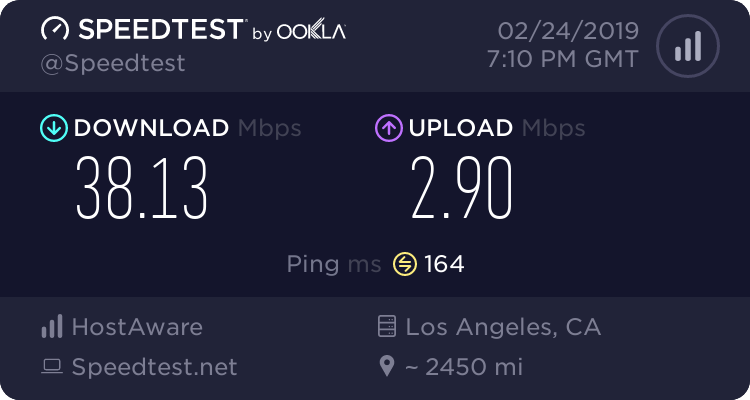 I managed to eventually get ExpressVPN to connect to Los Angeles 5 using the latest Windows app. The connection took about 5 minutes, so be patient if you try this. 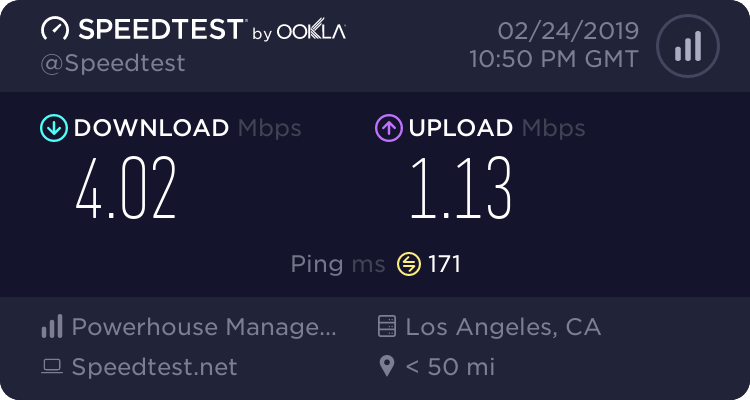 However, once I disconnected and tried to connect to Los Angeles 5 again, it didn't work the second time. I then decided to go on the ExpressVPN website and ask the live chat support what else I could try. After troubleshooting for some time, I was told to try using an old version of the app. Version 3.626 is meant for Windows XP and older operating system, but it also works on Windows 7 and Windows 10. I uninstalled the latest version and then installed the old version 3.626, and it works quite well. This version is working much better. Connections are fast and consistent to these 2 server locations. To download version 3.626 of the Windows app, go to the ExpressVPN website and log into your account. Choose Set up on More Devices, then click the link that says Show all versions. I should note that I was told to only use this old version if you absolutely cannot connect to any server using the newest version. You will need to uninstall the current version before installing this old version, you cannot have both installed at the same time. I'm not sure what happened last night when I got locked out of my remote access connection to my computer in China after connecting to NordVPN, but it seems to be working fine today. I tried some more of the servers with the old version 3.626 Windows app and I found that many of them are working. This old app is a hidden gold mine of working servers! 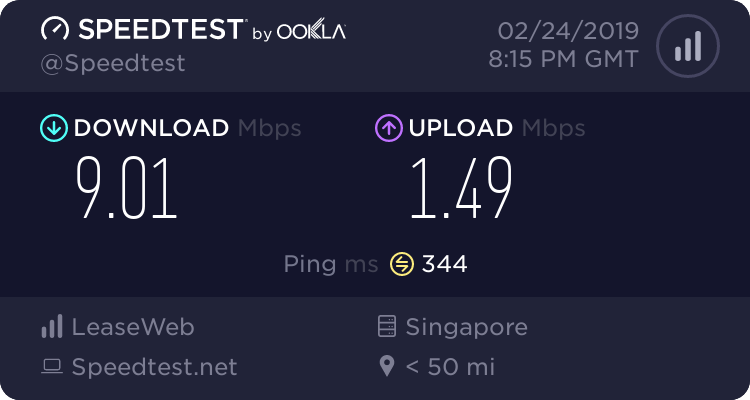 This is interesting because none of the Singapore servers have a ping time this low to China Telecom on the newer apps, even during normal times when those servers are working. It appears that some of these servers on the old app are on completely different networks. That would explain why they are still working right now. I noticed that there are also older versions of the app available for Mac OS, but I'm not sure if you will get the same results as Windows. You can certainly give it a try if you are using Mac and unable to connect to any server using the normal app. I believe the Android and iOS apps have working servers, but if you are having trouble, you can always use the old Windows app version 3.626 and set up your computer as a virtual VPN router. The old app v3.626 is still working very well. Connections are quick and reliable. I think the Hollywood server is the best one. Now I'm going to install the latest app version 6.92 and see if that is working better now. It took a long time to connect, but Hong Kong 5 is performing very well. Nice to see a server with a low ping again. Good speed, but very high ping. 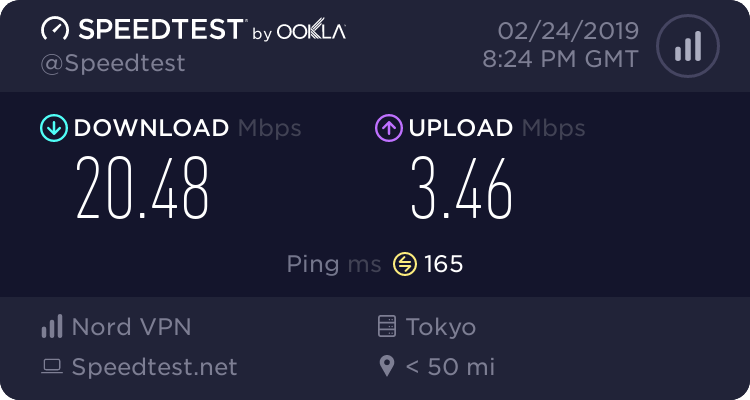 The connection from China Telecom to this Hong Kong server seems to be getting routed through Japan. Very good ping (for USA server) and download speed. It takes a long time to connect sometimes, but the newest app seems to be reliable again and connecting consistently without issues to several server locations. I am back in China and I just renewed my VPN.ac subscription. I have been looking forward to finally trying the WireGuard protocol, which VPN.ac is currently beta testing. There seems to be only 1 server that works in China for WireGuard, a Taiwan Hi-Net server. My test was done using the TunSafe client for Windows. The speed is not very fast, but it is around 11pm right now, so that is to be expected. One good aspect of WireGuard is that the connection happens very quickly. As soon as I pressed connect, it immediately connected. Not even 1 second of waiting time. I'm going to try the same server using the VPN.ac Windows app with the OpenVPN XOR protocol to compare. WireGuard does seem to perform a little bit better. One more quick test for VPN.ac. Let's see how ExpressVPN is performing at 11pm in China. The first time I got a bad connection and couldn't even finish the speed test. But then I disconnected and tried again, getting a much better connection the second time. Very good speed and latency for this time of night! But if you really want lightning fast speed at this time of night, then none of these VPNs can compete with a fast ShadowsocksR proxy server. The WannaFlix 30% off promotion for Tips for China visitors will be ending soon. So if you are thinking about trying WannaFlix, then now is the time to do it! I have to get to bed now, I'm still feeling jet-lagged from my flight back to China. I'll be in Hong Kong most of the day tomorrow. I will probably do some more VPN tests on the weekend. Now that I'm physically back in China, I can test some more devices. First, I will try ExpressVPN on my Android phone using China Unicom mobile data. As I recall, the Tokyo 1 server works well with China Unicom. First, a control test without VPN. Now I will test the Tokyo 1 server. Almost the full speed of my connection with decent ping time too. I would like to test more servers with mobile data, but I don't have enough data to spare right now. I need to find that SMS code to sign up for the 1 GB daily data package for 5 yuan. I also wanted to test China Mobile, but it seems that my SIM card has expired. I will have to get another one. Now I will test my Android phone using China Telecom WiFi. Very good speed and latency with Hong Kong today! Now I will test Hong Kong 5 on my computer. Finally, a test on an iPad using the latest ExpressVPN iOS app. ExpressVPN service seems to be fully working again on all devices in China, with one exception. I cannot connect to any server using my ExpressVPN router. Hopefully ExpressVPN will update the router app soon. No more time for VPN tests today. Check back soon for more updates. Enjoy your weekend everyone! Someone asked in the comments to test some US servers of NordVPN. Today I'm going to compare Asian servers and US servers for NordVPN and ExpressVPN. For NordVPN, I am using the obfuscated servers. For ExpressVPN, I am using the Auto setting. These tests were done between 8pm and 9pm on my Windows computer, connected to my China Telecom 100/20M home internet connection. It was difficult to find a working USA server for NordVPN, but I did find one eventually. Now I will test an Asian and US server using ExpressVPN. I have been using Hong Kong 5 over the past few days and I have to say that it's performing very well. It sometimes takes a while to connect, but just be patient. Now for a US server. And one more US server. I did quite a few speed tests using the WireGuard protocol as part of a new article that I published today. Check the article here for the details of the speed tests. Does WireGuard work in China? I finally got myself a new ExpressVPN router. I purchased the Netgear R6300v2 from Taobao, but there was a complication because I got a special version made for Charter Communications ISP in the US. I wrote a tutorial on how I finally got this version to work with the new v2 ExpressVPN router app. The router performance is pretty good for the price of 328 CNY. 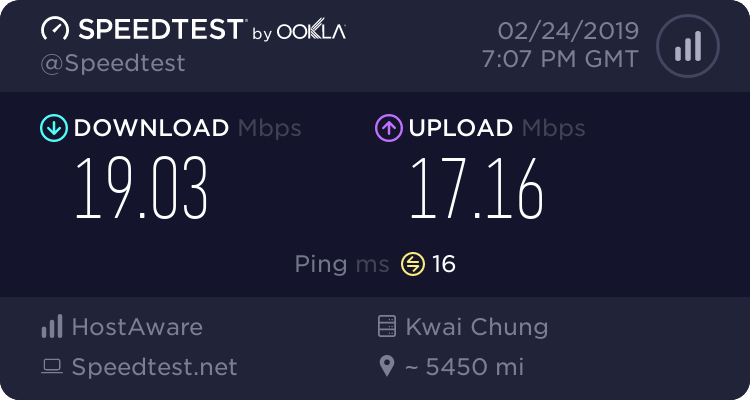 Today I am in Guangxi province using a China Unicom Fibre connection. These tests were done at 11pm on my Android phone connected by WiFi. I'm using the Android apps of ExpressVPN, NordVPN, and VPN.ac. Here is my speed without VPN. The China Unicom international bandwidth congestion during peak night time hours is not as bad as China Telecom. So I'm expecting some pretty good results tonight. First I will test ExpressVPN using the Auto setting in the app. Very good speed and latency. 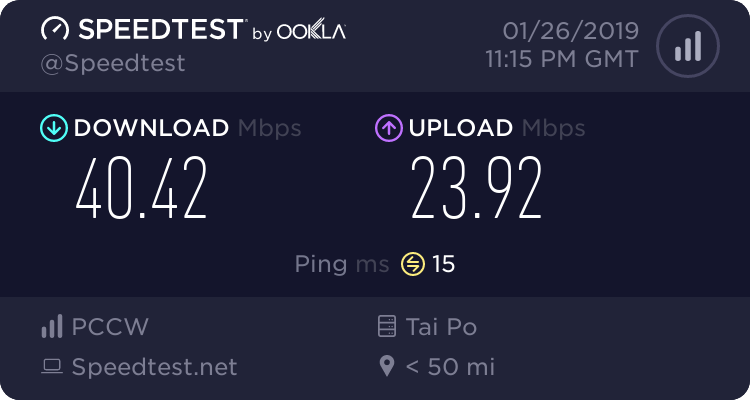 Surprisingly, the latency is only 2ms higher than the test without VPN using the Nanning location (less than 100 miles from my location). Unlike the connection to China Telecom, the ExpressVPN Tokyo 1 server has direct peering with China Unicom. Hence the good ping time of 68ms. High ping, but very fast download speed. This would be a good server for torrenting with China Unicom. Not much to say about this one. Pretty good for a USA server I guess. Next up is NordVPN using the obfuscated server setting on the Android app. I thought I remember this server having better ping time with China Unicom. I guess I was mistaken, or maybe that has changed since I last tested China Unicom. Pretty good download speed for NordVPN though. I'm sure this server used to have much better peering to China Unicom. The ping time to from China Unicom to Leaseweb was definitely under 100ms before. Overall, nothing too impressive with the NordVPN servers. But not terrible either. Next is VPN.ac using the OpenVPN XOR setting on the Android app. 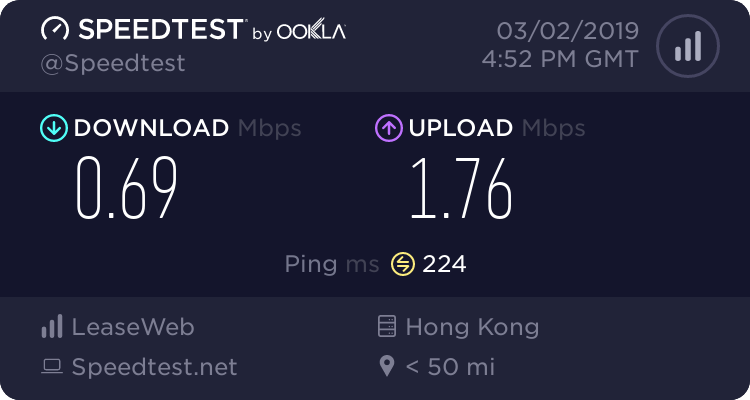 Like the NordVPN Hong Kong server, this one is also hosted on Leaseweb, which no longer has good peering with China Unicom. Good ping time, but the download speed is too slow. Good ping time and download speed. I would be lucky to get 2Mbps on this server with China Telecom at 11pm! Good ping (for USA) and download speed. That's all for tonight. Check back again tomorrow night for more China Unicom tests. Last night I tested some VPNs using China Unicom during peak bandwidth congestion time at 11pm. Tonight I will be testing Shadowsocks. Here is a control test without any proxy connected. 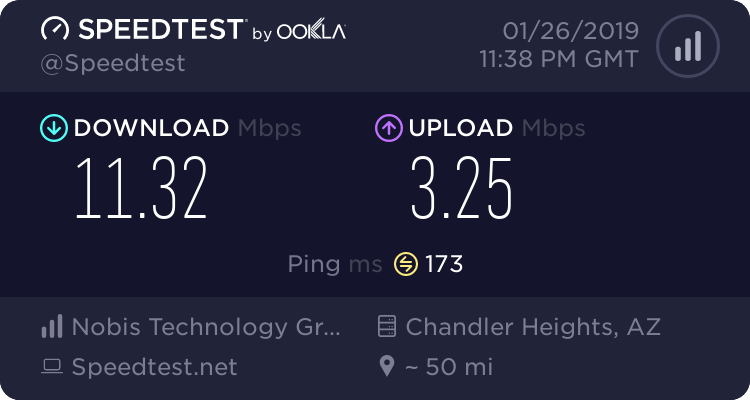 WiFi speed on my computer is a little slower than my phone here. First up is my favorite paid ShadowsocksR service called WannaFlix. WannaFlix offers a variety of ShadowsocksR servers with great performance in China and very reasonable prices. The very reasonable prices get even better if you use the Tips for China coupon code to save an additional 30%. These tests were done using the ShadowsocksR client for Windows. There are many more servers, but I don't have time to test all of them. The best feature of WannaFlix is that most of the servers work for Netflix, as indicated in the server names. Next up is 12VPN. Unlike WannaFlix, they are using the original version of Shadowsocks instead of ShadowsocksR with better obfuscation options. The following tests were done using the original Shadowsocks client for Windows. Although 12VPN doesn't offer Shadowsocks instructions for Windows users (they prefer you to use their dedicated app, which I don't like very much), I was able to get the Shadowsocks configurations from their Android setup page. There is something very strange going on with this server. It is hosted on Aliyun Hong Kong, one of the best hosting providers for China. 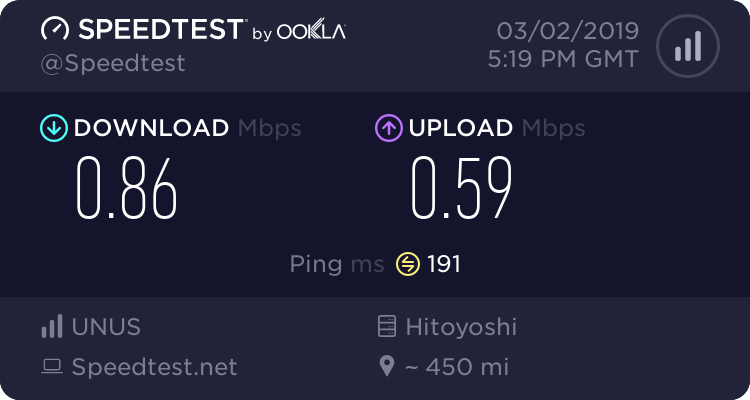 Normally, I can almost max out my connection speed with this server (close to 100Mbps when I'm at home using China Telecom). A friend sent me a message on Twitter a few days ago telling me that this server became extremely slow all of the sudden. He asked me to test my personal Aliyun server to see if the problem was with Aliyun or 12VPN. My personal Aliyun server is working fine, so the problem seems to be with 12VPN. I think they are intentionally throttling the speed on this server. Here is the reply that my friend got from 12VPN when he inquired about this. I also sent an email to 12VPN asking about this and their answer to me was "please try CN Optimized 2 (HK) now, it should be working". Anyway, here are some more 12VPN Shadowsocks tests with some of their other China optimized servers. 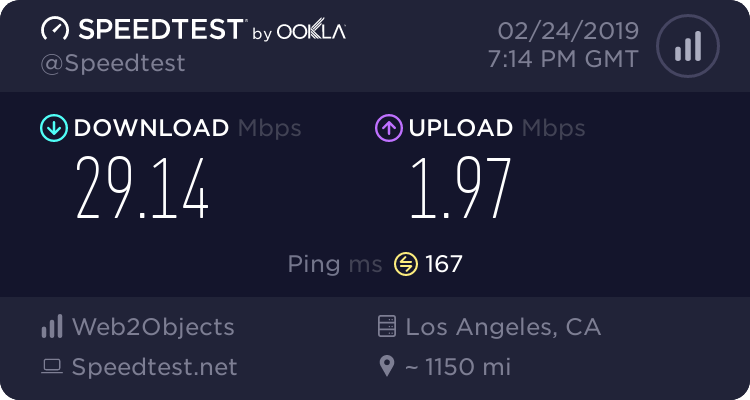 This server doesn't work on speedtest.net. I just get a message telling me that my ad-blocker is preventing the speed test from working. This is probably caused by some kind of port blocking or server blocking. That is one thing that I really don't like about 12VPN. Too much port blocking and traffic shaping. I think the WannaFlix service is far superior to 12VPN for Shadowsocks. The main advantage of 12VPN is that they offer many other protocols in addition to Shadowsocks, such as WireGuard for example. If you want to try 12VPN yourself, you can use the Tips for China coupon code for 25% off. For those of you who prefer to set up your own Shadowsocks server, here are some speed test results from a few of my personal servers. Even faster than the control test without a proxy! Aliyun Hong Kong really is the best of the best when it comes to affordable CN2 servers (as long as the speed is not throttled like the 12VPN server). The only problem with Aliyun is that it's a division of Alibaba, which is a Chinese company. I don't really feel comfortable trusting a Chinese company with my internet connection data. The best solution for this problem is to tunnel OpenVPN over Shadowsocks. You do lose some speed this way, but you gain a lot more privacy. Not only does this hide all of your traffic from the proxy provider, it also hides your real IP address from the VPN provider. It appears that Vultr is not very good on China Unicom. At least the Los Angeles location is not very good. This server works much better at home with my China Telecom connection. Sorry for being so secretive about this one. This is not a well known provider, and I prefer to keep it that way. I have been using this server for years, and it never gets blocked. Probably because it's not on the radar of the GFW due to it's low profile and few users in China. It's a direct connection from Beijing to Russia on China Telecom and China Unicom, and performs quite well. If you really want to know the provider, I just lightly blurred out the host information in the image above so you might be able to see it if you stare at it long enough. That's all for today. I will be going back home tomorrow so check back soon for China Telecom VPN performance testing in China. I wish I would have thought of this last night, but I can get faster speeds on this connection by plugging directly into the router with a LAN cable (the WiFi router is not very good). So here are a few retests showing the full speeds of the fastest Shadowsocks servers. I'm going back home today, no more time for testing. The great firewall of China has unblocked many VPN servers that were blocked during the latest VPN crackdown that started in February, 2019. Even some VPN services that don't normally work in China might be working right now. I can actually connect to almost all locations using the ExpressVPN manual OpenVPN config files with the OpenVPN GUI client. Unfortunately, the Great Firewall didn't show any mercy for the Taiwan 3 manual OpenVPN server. That one is still blocked. Although the performance of the ExpressVPN manual OpenVPN servers is pretty good, the best servers with low latency to China are only offered in the ExpressVPN apps. Currently, the best server for China is Hong Kong 5. So you can image my frustration when I was unable to connect to this server using the Windows app today. No matter how hard I tried, the progress circle meter wouldn't even move. It would just stay like this for about 5 minutes before showing the failure message. I found a way to make it connect that doesn't make sense at all, but it works. Step 1 - Initiate a connection attempt to Hong Kong 5 using the Windows app. Step 2 - While the Windows app is trying to connect, initiate a second connection attempt to Hong Kong 5 using another device other than Windows (Android, iOS, or router). When you do this, then both devices will connect to Hong Kong 5. At first I thought this was just a coincidence, but I found this behavior to be repeatable and consistent throughout the whole afternoon today. When I try to connect to Hong Kong 5 on Windows normally, it will fail every time. If I initiate a connection attempt to Hong Kong 5 on another device while the Windows app is trying to connect, then the Windows app will connection successfully every time. The other device has to make a new connection, it won't work if it's already connected. Anyway, here is the performance when connected using the above procedure. Another problem that I noticed with this new version 7 Windows app is that sometimes cancelling a connection attempt does not work. It just keeps trying to connect and won't let me change settings or choose another location until is finishes the connection attempt, which takes up to 5 minutes sometimes. These new app updates from ExpressVPN have very nice user interfaces and look great, but I find that the basic functionality of the VPN connections are getting worse and worse. I think ExpressVPN needs to spend less resources on the UX and more resources on the basic functionality of these apps. Something else I find very strange is that my old ExpressVPN router with the standard v1 router app still cannot connect to any server, despite the fact that so many servers are not blocked in China anymore. I know that there is no problem with that router because it works fine when I plug it into my Shadowsocks router (my current setup for streaming Netflix on my living room TV). But when I plug it into my normal router, not even 1 single server will connect. At least my new ExpressVPN router with the v2 beta router app is working fine. I wanted to test some more VPNs today, but I wasted too much time troubleshooting these ExpressVPN issues. April 14, 2019 - ExpressVPN Hong Kong 3 is back! I'm currently on an overseas trip, but I had to remote access my computer in China to check a rumor that ExpressVPN Hong Kong 3 is working again. I'm happy to report that it is in fact working. Very nice to see ExpressVPN Hong Kong 3 back in service again. It was gone so long, I was starting to think that it would never work in China again. I just hope that it's still working when I get back to China next week.